By the time the United States declared war on Japan and Germany in December 1941, the assimilation of the Volga Germans in Portland was well underway. While they remained proud of their ancestry, many men and women from the Volga German community faithfully served their country in nearly all branches of the Armed Forces and all theaters of the war. Many men and women also worked in Henry Kaiser's ship building yard on Swan Island or in other industries supporting the war effort. Betty Niederhaus recalled working seven days a week to meet production goals. Buses came to pick up workers on Union Avenue (now MLK Blvd.) and transport them to the shipyard. People were proud of their work, and despite their German ancestry, they identified strongly as Americans. Ironically, the German invasion of Russia in June of 1941, provided Soviet leader Joseph Stalin with the excuse he needed to deport all of the ethnic Germans living in Russia from their homelands to Siberia and Central Asia. 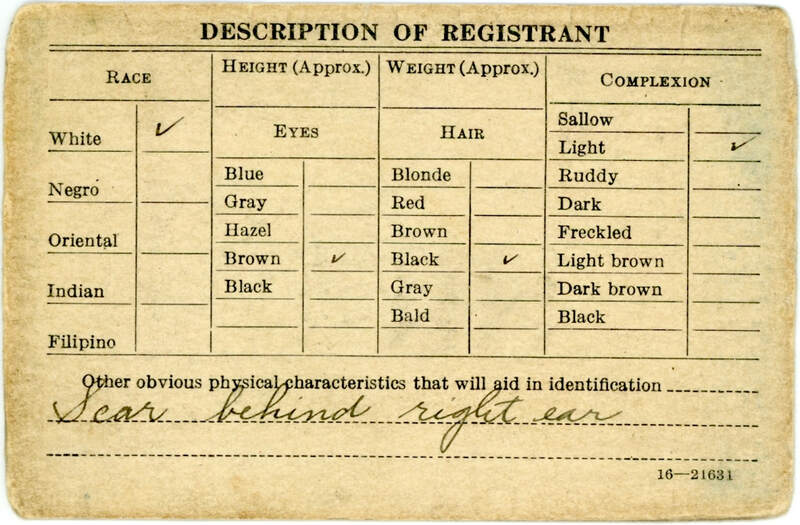 Most of the deportees were placed in "special settlements" and the Gulags. Families were often split. This act would sever any remaining connection between family and friends living in Portland and Russia for the next 50 years. 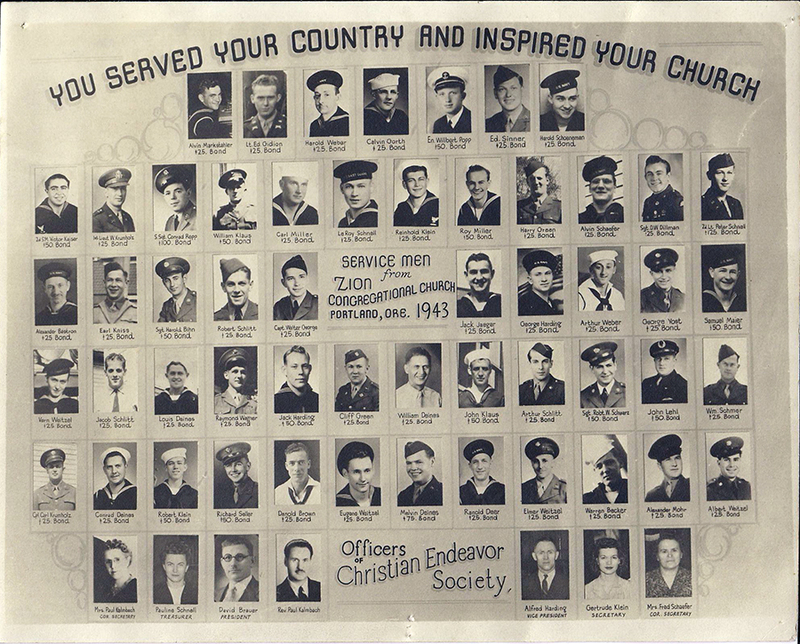 Members of the Zion Congregational Church serving in World War II in 1943. Photograph courtesy of Karen Drier Esayian. After two world wars, many of the first and second generations born in the United States outwardly distanced themselves from their German heritage, married outside of the ethnic group, moved away from the old Albina settlement, and assimilated into American society. 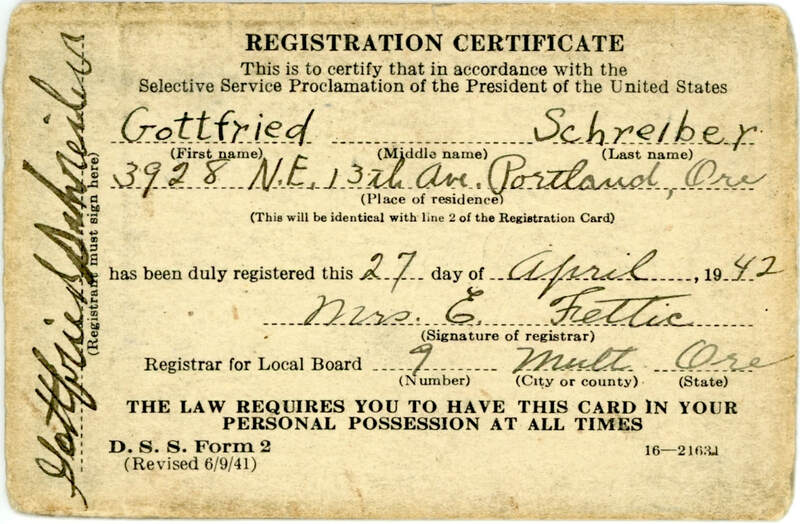 Selective Service Registration Certificate for Gottfried Schreiber. Courtesy of Vernon Schreiber. Haynes, Emma S. German-Russians on the Volga and in the United States. 1996. Print. Haynes, Emma S. My Mother's People. Unpublished manuscript. 1959. Print. Sinner, Samuel D. "The German-Russian Genocide: Remembrance in the 21st Century." Germans from Russia Heritage Collection. Web. 26 Aug. 2016. <https://library.ndsu.edu/grhc/research/scholarly/meetings_conventions/dr_sinner.html>.